I just returned from a girls’ getaway weekend with my best friend. It was a fantastic, relaxing weekend – just what the doctor ordered. So since I’m stuffed from a weekend of wining and dining on some really good eats, my camera is still broken and I’m in need of some quality time with the family (Oh, how I missed Mr. N and Miss A – dad too of course! ), I’m going to keep this one short and sweet. This is the recipe for the Cumin Couscous we made and used to fill our pitas alongside the chicken (which I’ll post tomorrow). I found the recipe at Tour Egypt and adapted it slightly due to the fact currants aren’t available right now. 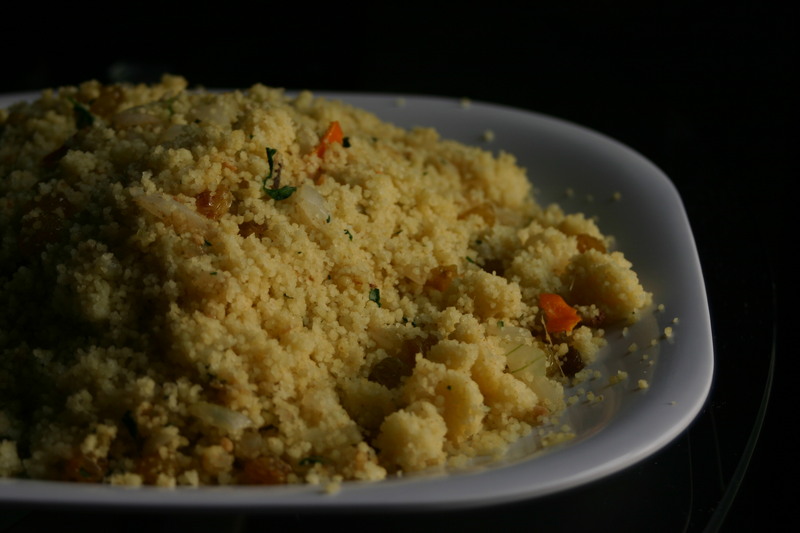 The couscous would also stand on its own and is a wonderfully sweet complement to a spicy dish. Bring the water to boil in a sauce pan. Stir in the couscous and raisins and let sit for five minutes, covered. In a skillet heat the oil, onion, garlic and ginger over medium-high heat. Sauté for 3 minutes. Add the cumin and sauté for another minute. Next add the couscous to the skillet and mix all together. Turn the heat to low and add the orange zest and cilantro. Serve as a side dish or inside pitas as a main course. Dad and Miss A gave the couscous 2 spoons. Mr. N and I both gave it 3 spoons. I particularly liked it in the pita with the chicken and would love to try it again with currants when they are available. This sounds great…trying it today. Thanks! Cumin in couscous… yes, please!! Jealous of your weekend getaway with a friend! I highly recommend it! My friend and I decided we need to take a trip annually. But we said that 9 years ago when we took our last one too. Ha! Couscous looks delicious. I usually cook it with tomato sauce. Your version looks very tasty! Tomato sauce would be great in this as well! I’ve never had Cumin Couscous or Couscous before. Yes, I know I haven’t gotten out much from working lol. But this really looks interesting and delicious. Great post and a girls weekend is always a relaxation time. That does look tasty and simple. I like the idea of using orange zest and cilantro. Nice – I love couscous (and of course cumin :D), although never tried it with currants, only raisins. If you have any left-overs you can turn it into a tabbouleh too with some cucumber, bell pepper, parsley and lemon-juice – that is some tasty stuff! That does sound very good – sadly no leftovers. Hubby finished up everything for his lunch the next day. He was a big fan of this meal. 😉 Next time I’ll make enough to set some aside to try the tabbouleh though. Have a good one Charles!